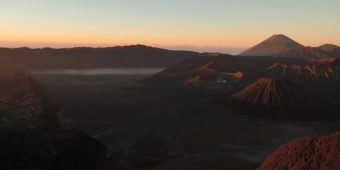 Caressing steep ravines, oases of apricot trees and rock gardens, they unroll their asphalt stretches on top of the world. 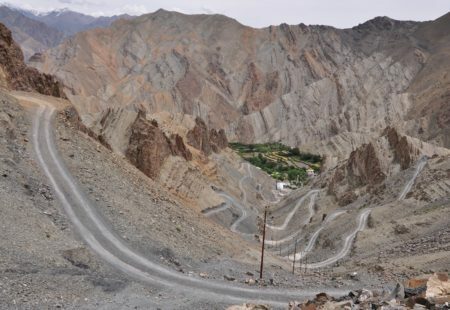 Operational only during the elusive summer season, the motorable roads of Ladakh, an old Budhist kingdom nested in the Indian Himalayas, are the highest of the planet. Straddled on the legendary Royal Enfields, the bikers have a great time riding along the curves of these imporbable roads. 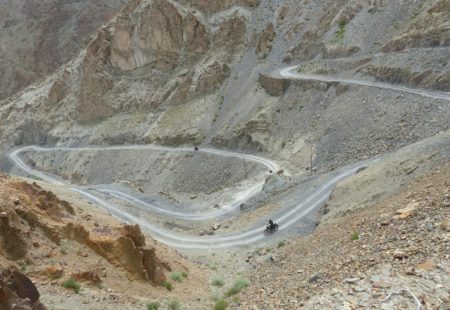 Defying imagination, they take you up along dizzy hairpin bends up to the passes that the travellers reach without pride. Amidst a lunar and magnificent landscape, colorful garlands of budhist prayer flags flap about in the wind and celebrate prowess: the Khardungla Pass, at an altitude of 5359 m, or the Taglanga Pass at 5328 m. With a short breath and flagelling legs, the travallers take some prize-photos hastily. Thereupon, in a line, sawying to the rhythm of the curves and bends, the motorcycles go back down to the peaceful valleys where life returns to normal. Looked after by nomads, herds of yaks and pashmina goats can be seen on the mountain slopes. 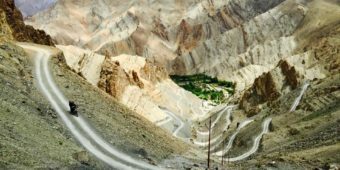 Further away, at the heart of the Nubra valley wedged between China and Pakistan, bactrian camels laze around, without batting even so much of an eyelid as the bikers pass by. 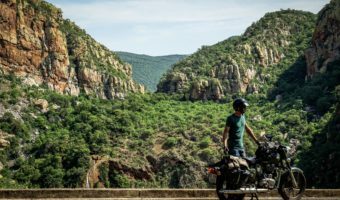 The Royal Enfield team slides into the depths of the valley, along a large river with clear water, beyond the white-walled monasteries perched on top of the cliffs. On the outskirts of a village, the Himalaya motorcycle trips tour leader stops his motorcycle to signal a break. The bikers who are following him park their bikes next to him, as does the support vehicle with Raju, the mechanic. Taking the helmets off, the group relaxes. 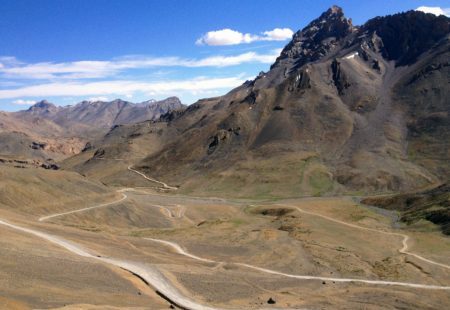 Stunned by these extreme landscapes and the thrills, the riders have the widest smiles fixed on their faces. Motorbike lovers, they form a small group coming from different horizons. But for all of them, this journey incarnates the motorcycle culture: escape and adventure. They did not know each other before leaving but, as the days go by and skins get tanned, the pleasure of the journey brings them closer. 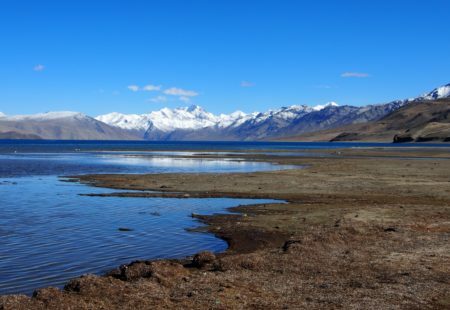 From the Sham valley to the Nubra valley, via Lake Tsomoriri, the biker team’s rhythm match up with one another. Road speed, monastery visits or the evening beer, they find their bearings. The bracing mountain air emboldens the most fearless who go on to defy the icy waters of the lake, bathing at an altitude of 4500 m.
« Come on, let's go? » says the guide to his bikers, marking the end of the break. At such altitudes, road maintenance is sisyphean task and the bitumen surrenders sometimes to the harsh assaults of nature. However, because of Ladakh’s strategic borders with China and Pakistan, their maintenance is a top priority for the Indian Army. From the first rays of the summer sun, workers start plugging the holes and consolidating the roads in extreme conditions. Under the authority of the highly efficient Border Road Organization (or BRO), these little hands maintain an exceptional road network on the roof of the world. « Darling, I love you but drive slowly », recommend the signboards put up by BRO, which is sensitive to the heady seduction of these roads which touch the sky. With the passing bends in an infinite loop, other signboards provide their advice: « Feel the curves, don’t test them », or « don’t go to sleep or your family will cry », or « Drive, don’t fly »... These signboards have become so famous that a book has been published with the best of these. In the plains of Ladakh, the Royal Enfield finds its purpose of life. 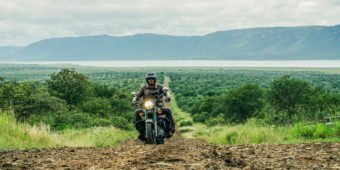 This legendary bike incarnates adventure and style. 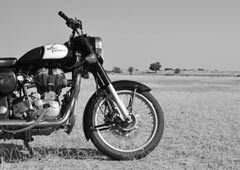 Founded in 1890 in England, the Royal Enfield was launched in 1940, the Bullet 350 with which Indian equipped its army by opening a local production factory. The firm Enfield India Limited has persevered while the British factory disappeared in 1970. 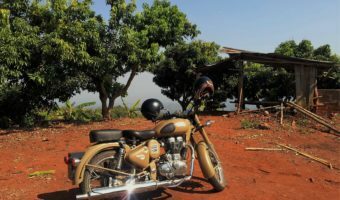 In India, the Bullet shifted to 500 cm3 and adopted a few improvements, but it remains the oldest motorcycle of the world to be still in production. And its retro shape hasn’t changed. 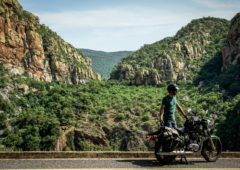 The Bullet incarnates a travel philosophy and a certain outlook of the world. In India’s Enfield Clubs, the motto is simple: « Ride to live ». 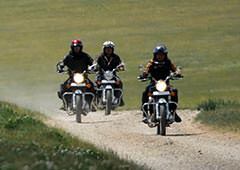 Discover our Himalaya motorcycle trips!